A History of the Jews (via musical theater) was presented at The Town Hall on February 27th. And you didn’t have to be Jewish to kvell listening to songs from Sondheim, Bock & Harnick, Rodgers, Kander & Ebb and Webber – to name just a few of Broadway’s best. Hosted by one of comedy’s elite, Robert Klein opened the evening kvetching – – “I Don’t Like Getting Older” (Robert Klein/Bob Stein) and we learned more than we needed to know about colonoscopies. The running theme of the concert centered around a cell phone call from God to Klein; she just wasn’t happy with how things were going and was getting prepared to destroy humanity. So it was up to Klein to remind her about major events throughout biblical history that proved humanity wasn’t such a bad lot after all. The cell phone bit did get tiresome as the evening wore on, as the joke lost its edge, but the talent on the stage made up for it. Written by Glen Berger (Underneath the Lintel, Spiderman:Turn Off the Dark), Frank London led the band, and the Klezmatics, featuring an eager cast that included Joanne Borts (contemporary Yiddish theater performer – Broadway debut, Fiddler on the Roof 1991, original cast Once) with “Here in Eden” (The Apple Tree – Bock/Harnick) and “Song of Ruth” (The Eternal Road – Weill/Wurfel). An amusing Steve Rosen (premiere of A Confederacy of Dunces, Spamalot) sang ”Close Every Door” (Joseph & The Amazing Technicolor Dreamcoat – Webber/Rice) and “If You Could See Her Through My Eyes” (Cabaret – Kander/Ebb). 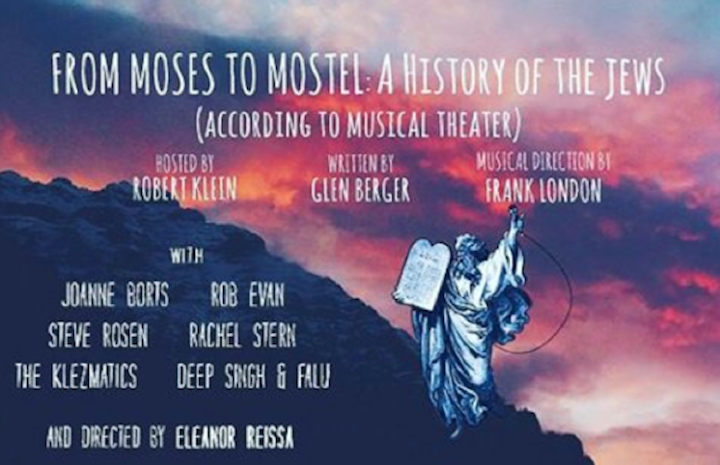 Rachel Stern (Shrek the Musical, High Fidelity) wowed with “Mene Mene Tekel” (Pins and Needles – Harold Rome) and “Who’s this Geezer, Hitler” (Blitz! – Lionel Bart). The incomparable voiced Rob Evan (Jekyll & Hyde, Les Miserables) rocked the rafters in “Heaven on Their Minds” (Jesus Christ Superstar – Webber/Rice) and offered a passionate “In My Own Lifetime” (The Rothschilds – Bock/Harnick). Other highlights included “Is Anybody Listening” (The Ten Commandments – 2004) featuring a fiery Rob Evan, Falu and Deep Singh; an amusing company offering “Put Him Away” (Two By Two – Rodgers/Charnin) and a rousing “The Inquisition” (The History of the World,Part 1 – Mel Brooks). Notable Lorin Sklamberg, the Klezmatics front man, displayed his golden voice brilliantly on several songs garnering cheers from an appreciative audience. Although the brass section occasionally overpowered individual performers, From Moses to Mostel was a feel-good night of memorable music that could have been shorter. It was directed by Eleanor Reissa.